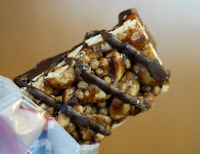 Welcome to the kick-off day (Day #1) of Chocolate, Almond and Hazelnut Theme Week. 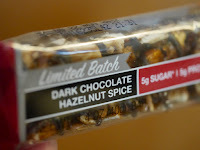 I enjoyed today's Dark Chocolate Hazelnut Spice "Limited Batch" Nuts and Spices bar from Kind LLC (New York, NY). 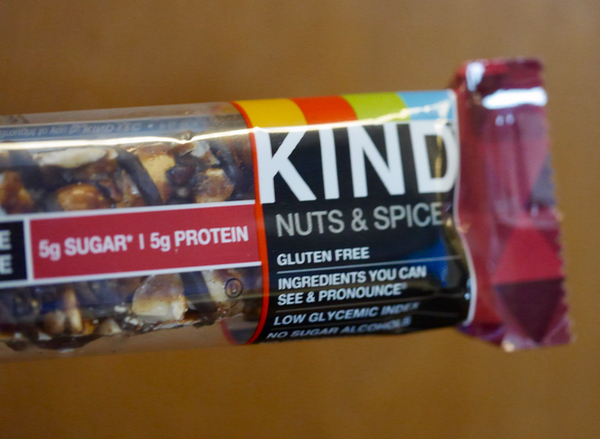 Most of Kind's gluten-free snack bars* are guaranteed to be packed with crunchy nuts, and not too much sodium or sugar. A dark chocolate backing and drizzle (and a dash of cocoa nibs in today's case) added chocolatey rich flavor. This Hazelnut Spice bar contained (no surprise) hazelnuts—as well as almonds, cashews and peanuts. The hint of holiday spice was provided by nutmeg and vanilla. *Particularly Kind's Fruits and Nuts and Nuts and Spices bars.